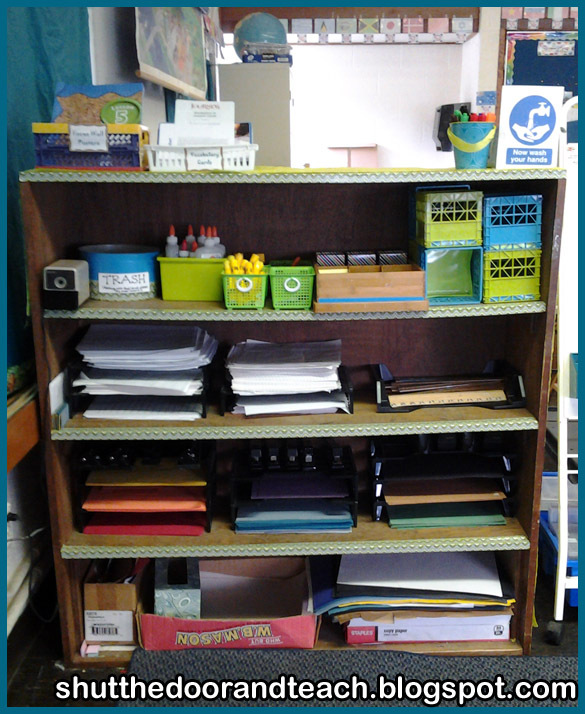 I made a few minor changes to the Students' Materials Shelf a while back. Since I decided the theme of my changes this year would be "consistency," I swapped out the few Sterilite shoeboxes to give my Math Manipulatives Area a cohesive look. So I thought it would be a good idea to get more lime green and aqua containers for this shelf. I love the little Unitz crates from Staples, so I thought I'd just get more of the same. 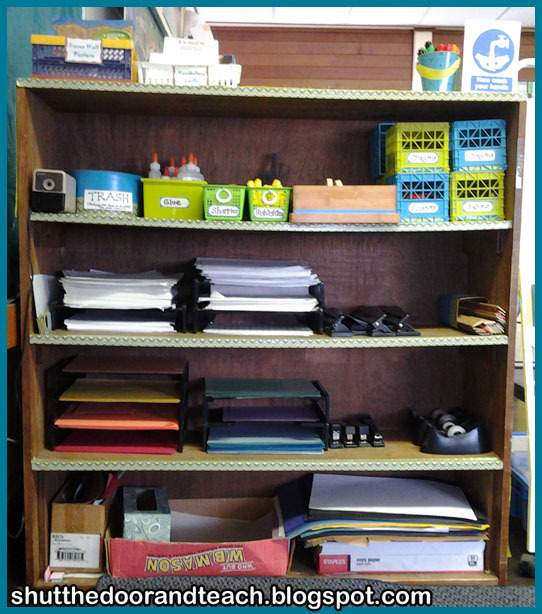 My next dilemma was what to do with the larger items, like rulers, hole punchers, tape dispensers and staplers. I've never been sure how to house these, and then I got a great idea: paper trays. I could create vertical storage and the kids could take a whole tray with them when it was time to distribute them to groups. 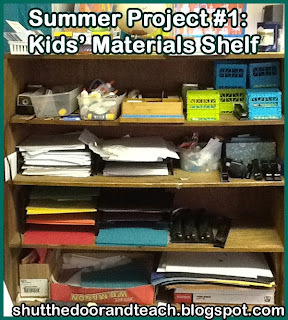 So I'm still not happy with my materials shelf situation. If anyone could give me advice in the comments below I'd be grateful! 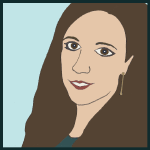 On the other hand, I made a few positive changes. I found some lime green baskets in Target's Dollar Spot. They're not exactly what I wanted since I can't stack them, but they're a good size for my highlighters, Sharpies and scissors. I also found some tiny striped boxes at Target that fit inside my wooden box to hold paper clips, staples and erasers. That's a plus because the paper clips could slide under the dividers in the wooden box; hopefully this will contain them better. And finally I found some cute pails, also in the Dollar Spot that I'm not sure what to do with; I only found a use for one of them (holding my chart paper markers). That plus some Frixion pens on sale meant a successful shopping trip that day! The next improvement I made was to my mini trash. It fits in with the theme with the help of a bit of Duck Tape. The mini trash was a real success last year when it came to reducing sticky note wrappers and the like being stuffed any old place on the shelf by kids who were too lazy to walk 15 feet to the barrel, haha. Seriously, my class this past year was one of my neatest ever and I think organization tricks like this help. Now it also fits in! 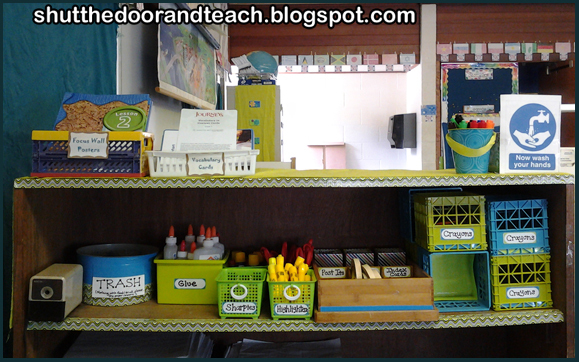 Another good use for the Duck Tape was to create a border on the lip of each shelf. Like the bookshelf, this shelf is so old and worn it has given the kids and I splinters. 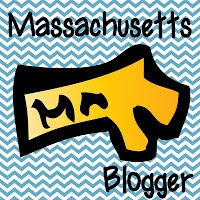 So not only does the border tie in with my color scheme, it will hopefully also prevent some nurse visits! So this shelf is still a work in progress, unfortunately. I'll check Pinterest, but if anyone can advise me on the ruler, stapler, hole punch and tape dispenser situation I'd be appreciative. I'm sure they are not going to stay balanced on top of the paper trays as shown below once the kids arrive! 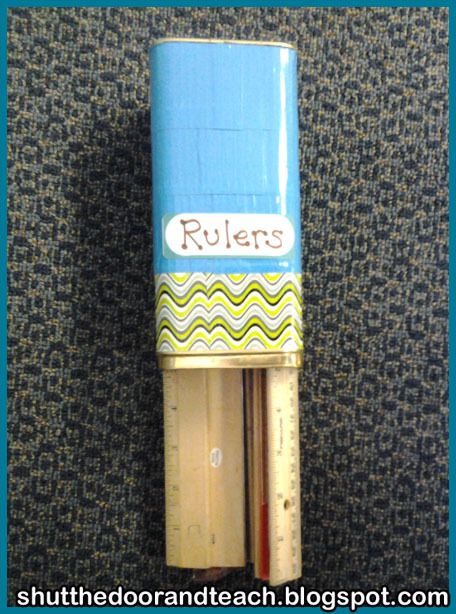 Update: Thank you to Kim from Quintessential Lessons for a great solution to my ruler dilemma! Although a Pringles can is too tall to fit on my shelf, I could lay it flat if rolling wasn't such a problem. However I had on hand a rectangular prism shaped can (Bentley tea tin) that now fits in well thanks to some Duck Tape! 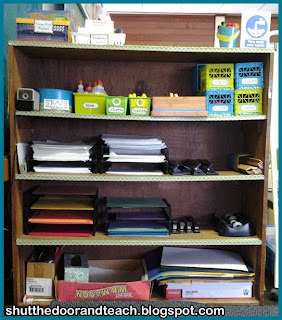 Still looking for ideas on how to stack the tape dispensers, hole punchers and staplers. Does anyone have a solution?